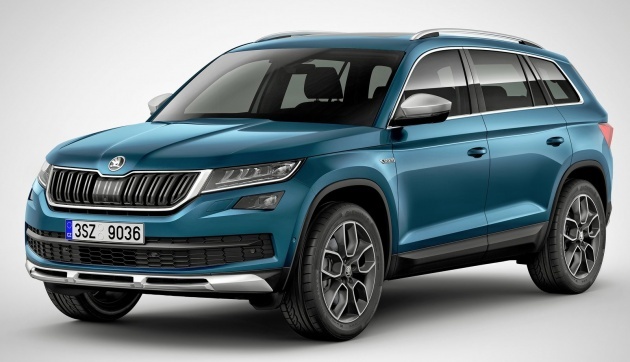 The Skoda Kodiaq, unveiled in September 2016, will have a more rugged sister come March. The Skoda Kodiaq Scout will debut at the 2017 Geneva Motor Show wearing outdoor apparel and some off-road hardware. 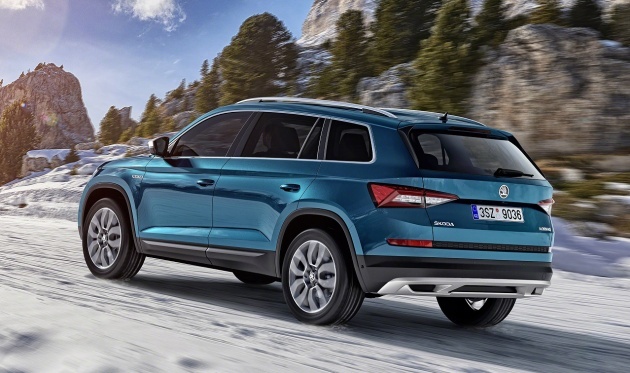 The Kodiaq Scout’s more macho appearance is accentuated by silver-coloured design details including distinctive underbody protection at the front and rear, which are split into three parts. Other silver bits are the radiator grille frame, roof rails, wing mirror housing and the side window trim. The unique (and standard) 19-inch alloy wheels also contribute to the strong look. The Scout is also recognisable from the outside by the tinted rear window and rear side windows, which protect from the glare of the sun. VW’s Czech brand offers a choice of two petrol and two diesel engines. The gasoline ones are the 1.4 TSI (150 PS) and 2.0 TSI (180 PS, fastest of the range with 0-100 km/h in 8.0 seconds), while the oil burners are 2.0 TDIs in 150 PS and 190 PS forms. All-wheel drive is standard across the board. The centrepiece of the AWD system is an electronically controlled multi-plate clutch that is located directly in front of the rear differential (at the end of the drive shaft) for optimal distribution of load on the axles. The big Skoda runs mainly on its front wheels in normal driving, with drive shuffled to the back when needed. It should be decent on not too severe trails, too, with a ground clearance of 194 mm, ramp angle of 19.7 degrees, plus good approach and departure angles at 22.0 and 23.1 degrees due to the short overhangs. In addition, the standard Rough-Road package protects against damage to the underbody, engine, brake and fuel lines as well as cables. The Scout driver can select off-road mode simply by pressing a button. The optional DCC shock absorbers change their mode of operation accordingly, and the throttle response becomes softer. The ABS anti-lock braking system permits a certain amount of slip; ditto the ASR. When required, the Hill-Hold Control and Hill-Descent Control functions are there. The equipment and interior design are based on the seven-seater Kodiaq‘s Ambition trim level. A multifunction steering wheel, LED ambient lighting in ten colours, a Modular Infotainment Matrix (MIB) with eight speakers, Alcantara-covered seats with the Kodiaq logo, door trims in the Alcantara design, steel pedals, textile floor mats and the Kodiaq logo in the front door sills are all standard. I wonder how much would be?